In 1982, long before movies became the source of most stage musicals, the puckish songwriting team of Howard Ashman and Alan Menken took as their inspiration a schlocky sci-fi flick from the low-budget factory of Roger Corman. To them, Little Shop of Horrors, the tale of a man-eating plant from outer space that changes the life of a nebbishy flower shop clerk, had doo-wop potential. The fact that the show played more than 2,200 performances off-Broadway, generated a cult favorite movie version and continues to be revived by theaters across the country seems to validate their opinion. Further proof can be found in a sprightly, well-cast mounting by MNM Productions, currently running at the Kravis Center’s Rinker Playhouse through Dec. 17. While the show does have an alarmingly high body count and ultimately the fate of the world is jeopardized, Little Shop of Horrors is a family-friendly comic entertainment whose tongue is planted firmly in its cheek. From the opening Greek chorus of three nimble-stepping, hand-jiving, street-smart urchins (Nayomi Braaf, Gabrielle Graham, Shenise Nunez), Menken’s faux-’60s sound and Ashman’s period-specific lyrics speed the show along to its apocalyptic conclusion. You see, following a total eclipse, klutzy Seymour Krelbourn (Mike Westrich) discovers an extraterrestrial plant, a customer magnet that changes the fortunes of Mushnik’s Skid Row flower shop. More importantly, it brings Seymour media attention, wealth and the love of his co-worker Audrey (Mallory Newbrough), a dumb blonde with severe self-esteem issues. The catch is that the plant – dubbed Audrey II in honor of that co-worker – craves human blood that Seymour must provide, a Faustian bargain with serial homicidal repercussions. And the MNM production kills as well. Director Bruce Linser does nothing unconventional with the material, but he moves the show along briskly, gets first-rate work from his performers and dials back a bit of the cartoonishness often associated with the characters. Westrich played Seymour previously at Slow Burn and he again slips into the character’s nerdy, slump-shouldered skin, relating easily to the bloodthirsty plant puppets and handling the light rock score with gusto. He is well-matched by Newbrough who warbles the show’s two best numbers – “Somewhere That’s Green” and “Suddenly, Seymour” – with a sly comic wink. In a year that has seen her also play Janis Joplin and Beauty and the Beast’s Belle, Newbrough has quickly risen to the top of the area’s musical performers. Jim Ballard lends protean support as Audrey’s doomed boy friend, sadistic dentist Orin Scrivello, as well as a few other goofy cameo roles. And Peter Librach has some good moments as old man Mushnik, notably with his Fiddler-esque ethnic moves on the song-and-dance duet, Mushnik and Son. MNM emphasizes its commitment to live musical accompaniment, represented here by keyboardist Paul Reekie and his four-piece band. The dean of South Florida scenic designers, Tim Bennett, completes his 40th year on the job with an aptly grungy Skid Row urban view that swivels to reveal the increasingly upscale flower shop. Ashman and Menken would go on to Oscar-winning glory writing film scores for Disney (The Little Mermaid, Beauty and the Beast), but for it’s more playful and sophisticated humor, Little Shop of Horrors is the pinnacle of their partnership. 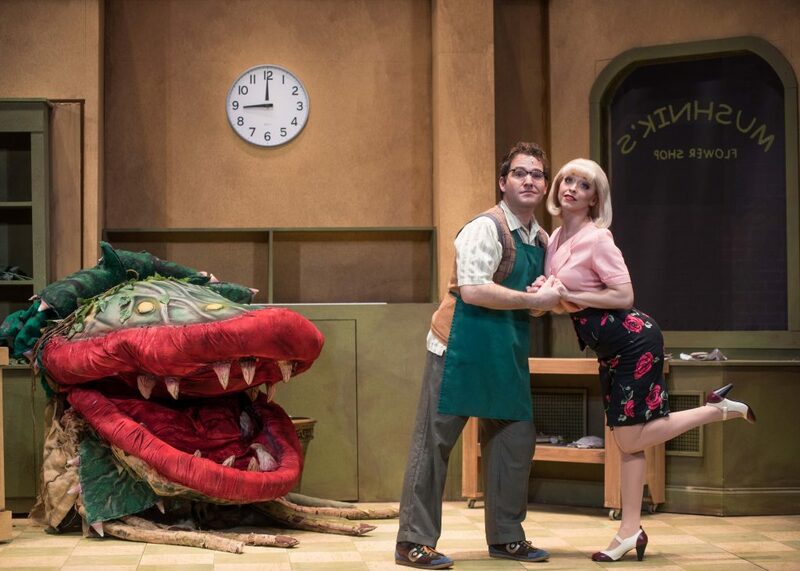 LITTLE SHOP OF HORRORS, MNM Productions, Kravis Center’s Rinker Playhouse, 701 Okeechobee Blvd., West Palm Beach. Through Sunday, Dec. 17. $35-$45. 561-832-7469.